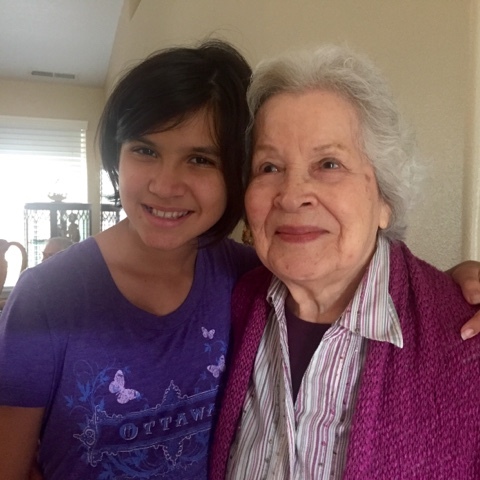 Maria with her great-grandmother, Eunice. Only two hours delayed and not a bit weary, we made it to our destination, Albany, Oregon. Actually, our real destination was into the loving embrace of family. Every bit worth the trip. There was even cake left over from Grandma's birthday celebration! We began our train adventure on Grandma's ninety-fourth birthday and made it in time for a happy, extended celebration with Delia and Ron, Aunt Becky and my cousin Deborah. Today we are waking up near the coast... over some rivers, through verdant woods, to Grandma Boo's and Grandpa Ron's we go!